One of the most unique and beautiful souvenirs you can find while walking on a seaside or lakeside beach is a colorful treasure of sea glass polished and cured by the waves. Sea or beach glass fragments come in the most amazing rainbow of colors, from frosty white and pale blue to blazing red and deep green and are the product of man-made debris tumbled on the ocean or lake beaches for years, eventually ending up being found on beaches all over the world. Beach glass / sea glass, like other beachcombing finds is used by crafters and artists to produce pleasing objects that may be for personal use or for sale. What is the difference between Art and Craft work? When does craft become art? We feel that Christy Jackson Nicholas does a very good job of exploring the meanings or "feel" of these words. Many people use the terms interchangeably. However, I believe that they describe different things. Craft is the technical ability, while art is the creative ability. Both are necessary to create works of art. Someone can have incredible artistic vision, but not have the skills necessary to translate that vision into a tangible form for others to enjoy. Others may have high craft skills in constructing something, yet not have the creative vision to create something different. Applying that definition to objects made using sea glass, let's see what we find. Sea Glass Art - "Stained Glass"
Do You Have an Art Project to Show Us? Sea glass, among other beachcombing treasures, is collected yearly by thousands of beach goers and is usually found between the wrack line and the low tide line on the beach after a high tide and storms. Sea glass pieces range in size from tiny chips to larger intact chunks of bottles, tail lights, windows or whatever other glass debris may have been tossed into lakes, rivers, seas and oceans by man, either through intent or accident. The transformation these pieces go through before appearing on the shore as sea glass again is nothing short of a marvel. Many people collect these pieces and simply store them on a shelf at home, in a jar right next to the seashells. Their beauty lies in their colors or contrasts, especially when light is shown through them. Because of that, some collectors will eventually turn this debris into some truly astounding art. Sea glass pottery and art can take many forms. Artists who prefer the medium of clay will embed pieces of sea glass into thrown or molded works as decorations. The usual forms include pots, jugs, vases and mosaics. 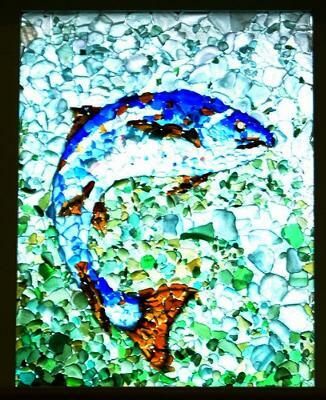 The sea glass can be used to make mosaics and hung on a wall. A table top can be the base for a creatively-designed mosaic. Mixed media artists add sea glass to driftwood, shells, pottery shards or other media to created artistic hangings. The artist may need to learn the craft of drilling holes in the tiny pieces of glass in order string them to create 3D sculptures of wired glass mounted on stretched canvas or riveted to metal findings. Drilling sea glass in preparation for threading with wire or cord or for riveting can be a tricky proposition. Glass is fragile and can be easily fractured with a drill bit if you are not careful. Drill slowly and work both sides of the glass until you have the completed hole. Immerse the sea glass in water. This tempers the glass and keeps it from chipping, burring or breaking. It also protects you against breathing in tiny particles of glass as you drill. 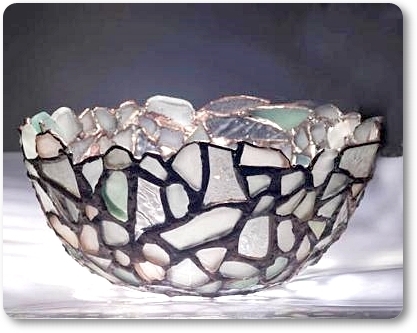 The most beautiful use for collectible sea glass might possibly be in "stained glass" projects as displayed in the Art Bowl and the "leaping salmon painting" on this page. In similar ways, crafters and artists have made and sold pieces ranging from small pendants to sun catchers to window panes. A sea glass window like the one shown above requires a craftsman. The sea glass is usually glued to a glass or plexiglass backing. That part seems pretty basic. The artist comes into play in his use of creative design and strikingly innovative and original way the colors are used to depict a lifelike fish that almost seems to be jumping on the end of a fishing line. 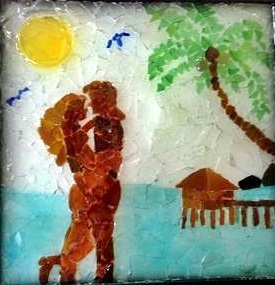 A mosaic-type project using sea glass can be just as creative and artistic. This kind of project is usually done by gluing the sea glass into a molded wire framework that has been bent into the desired design or by wrapping each piece in wire and cold soldering it together. However it is done, the finished effects can be truly striking. Likely the most visible form of sea glass art today is creative photography. As in the case of any kind of art, the artist must also be a craftsman. In this case, the craft of photography and, especially, close-up photos. A good example of this very popular art is seen in our Odyssey Sea Glass Photo Contest submissions, where folks from beginners to accomplished photographers submit their works of art. Tina Lam, a sea glass photography artist living in Hong Kong, has a really nice book out showing what you can do with sea glass and a camera. She uses the sea glass she has collected from the beaches near Hong Kong and a variety of backdrops. Whether you craft or simply collect, artwork done with sea glass can be the most beautiful items found. Each finished piece, especially the "stained glass" window panels and mosaics, are individually unique, and well worth the price most collectors are willing to pay. Nothing pays homage to Mother Nature better than using provided wonders to create even more beauty in the world. Odyssey Contributing Author Diana lives in India and brings a fresh outlook with each article she writes! Please share your sea glass art projects and ideas here. First, enter as much information as possible about your sea glass or beach art. For example. what materials you used, where you got the materials, what gave you the idea, how you created the art, etc. 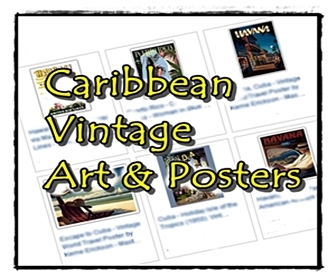 We need a photo of your art in order to build your web page. You may need to resize your very large photos before they will upload. To upload a photo, it should be less than 1000 pixels wide. Click here for easy instructions on resizing your photo. Below the submission box, find the "Browse" button and find a photo that's on your computer. Double click the photo name to choose it. You'll see the file name of your photo appear on this web page. Then follow the instructions that appear. We need a photo of your art in order to build your web page. Click the button and find the first one on your computer. Select it and click on the button to choose it. I create sea glass art from sea glass found from all around the world.